I didn’t even know what to look for when I first had kids. I remember religiously using only the “baby” lotion that we had gotten at our shower on my own hands when I had a newborn because I figured I would be touching his body and didn’t want to “contaminate” him with harmful chemicals or scents. So I had a consciousness. I had a drive to keep that tiny body safe from environmental harm. But I had no clue how to read ingredients. I can bet that if I had that name brand lotion in my house right now, the components wouldn’t pass my standards anymore, not when I have 3 ingredient MadeOn lotion everywhere in the house. It’s been a decade-long process of dozens, maybe hundreds, of baby steps to get from that level of carefulness to the crazy, eco-friendly, ingredient nazi I am today. And I think I’m proud of that? It’s a little annoying to be so well informed, honestly, because I have to be so careful about everything. 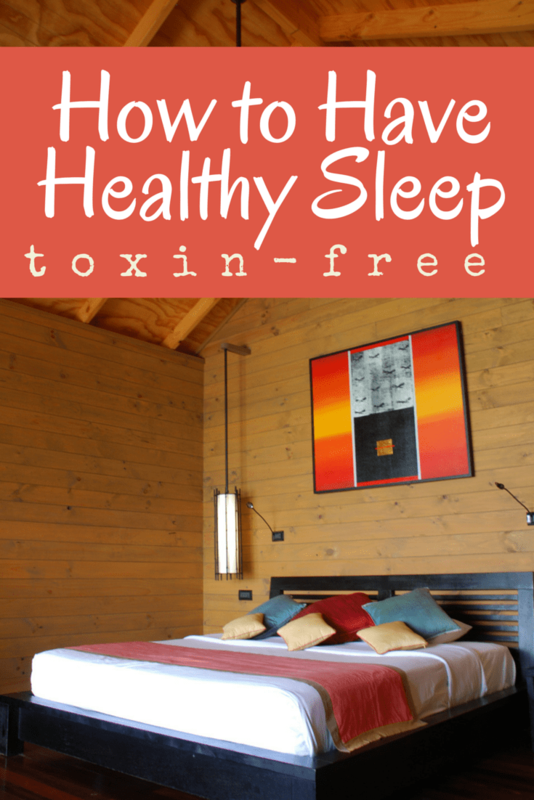 I’ve mentioned a bit during this healthy sleep series that it’s been both a long process of researching and purchasing healthy sleep surfaces (3-5 years?) but it was also one of the final frontiers for our green living changes. That’s a little backward, really, because of the high percentage of our time we spend sleeping. If you’re still near the beginning of your journey, kudos to you for tackling the sleep issue! One item we had (and have) a LOT of in our house is waterproof pads. We doublesheet our kids’ beds and cribs with them, use them under co-sleeping babies to protect our own sheets/mattress, put them on the floor for quick diaper changes, and I bet we have over a dozen in the house of all sizes, from bassinet to twin. I never thought to check the material of all the ones we bought from Meijer with each passing babe. And what would I have paid attention to if I had been older and wiser on those shopping trips? When I was shopping last fall for mattress protectors for twin and double sized beds, I suddenly was learning a lot on accident about dust mites, bed bugs, mold and mildew. After I had about 50 tabs open and my head was spinning, I asked on Facebook for advice from the KS crowd. That thread contains advice for everything from lanolized wool to cheap vinyl-topped pads from Walmart to Babesafe mattress covers like I mentioned in the crib protection/healthy sleep for babies post the other day to just leaving the plastic on that the mattress came in. Funny. That didn’t stop my head from spinning at all. Ultimately through my own research, I realized that vinyl (PVC) is a very common component of waterproof mattress pads and particularly covers that protect the sleeper from dust mites and mildew that might already be in the mattress. So vinyl is great for protecting you from your mattress and your mattress from you (waterproof) – but it comes with plenty of problems on its own. Vinyl off-gases VOCs, or Volatile Organic Compounds. That’s basically a fancy name for any natural compound that leaves the solid or liquid it’s in, turns into a gas at room temperature, and enters the air. (Organic meaning “of the earth” or biological, not mineral.) Most scents from products are VOCs. Not all of them are harmful, but many are, and it’s very hard to study them because human exposure is so long-term and constant. There’s some controversy about whether vinyl’s VOCs other than phthalates are harmful or not really, but honestly? For 8-18 hours a day depending on who the sleeper is, it’s just not worth the risk. EDIT: Peva is another waterproof plastic found in mattress protectors – it’s a non-chlorinated form of vinyl, so the products will likely say “no PVC” on them, but it doesn’t mean “no vinyl.” Removing the chlorine seems to remove some of the VOC off-gassing risk, but it doesn’t remove all the safety questions. It seems like peva is a newer attempt at waterproofing with vinyl, so it’s likely largely untested in the long term. I’m wary of it and would rather go with something completely vinyl free, personally. Read more at these sources: 1, 2, 3. Actually, I don’t rightly know how to say it even once personally. But I know phthalates are plasticizers add to things like PVC (uh huh!) to make it more flexible. They do offgas and/or leach out into the environment. 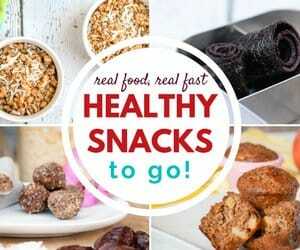 They do cause health issues like hormone disruption, cancer, and more. I don’t want to hang out with them all night long. 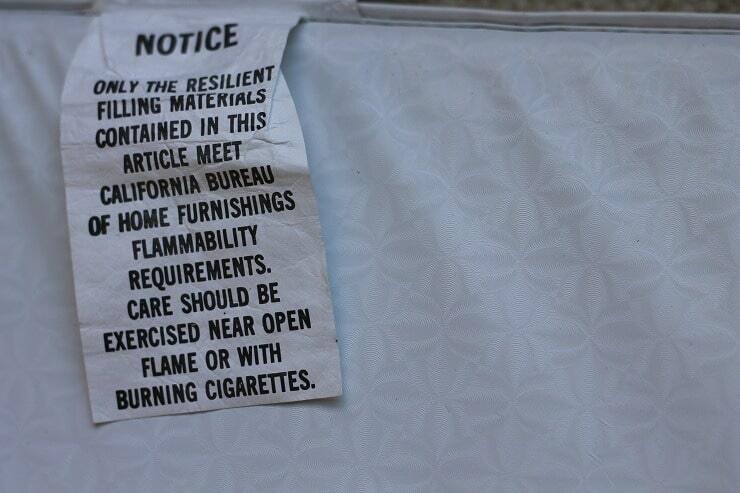 Another reason to run for the hills if you see “vinyl” or “PVC” on a mattress protector. We talked about these nasties already last week when I discussed the hazards of your mattress. You’ll see foam included in padded things like changing table pads, so it’s worth mentioning in this discussion. Polypropylene – food grade as well, the same as the number 5 plastic in most food storage containers. Not supposed to off-gas. This one should be a good option as well. UPDATE 2016: As you’ll see on the big review, we had a pretty poor experience with this material holding up to washing, too, so I’m not sure this is a great option for effectiveness. Wool – Wool is only “sort of” waterproof, best for minor moisture, not a total disaster like vomit or bedwetting. There is an allergy concern for some people with wool. Ultimately with my 2016 updates, it sounds like polyurethane may actually be the best disaster-proof material for waterproof pads! I had a huge document of my shopping research, and I ended up getting quite a number of mattress pads, some purchased, some as review samples, so here are all the reviews of the best natural waterproof mattress protectors I could find! Nicely put. I had a thought along these lines just yesterday. I haven’t tried nylon on a bed, but it’s the waterproof layer in a number of my cloth menstrual pads and the material of my baby’s cloth diaper covers, and it works very well. A thick polyfleece blanket is what I use under a potentially dripping child, because moisture beads up on it (it will soak through, but takes a while) so if I pull it off right after the leakage, the bed under it is dry–and it washes really well. 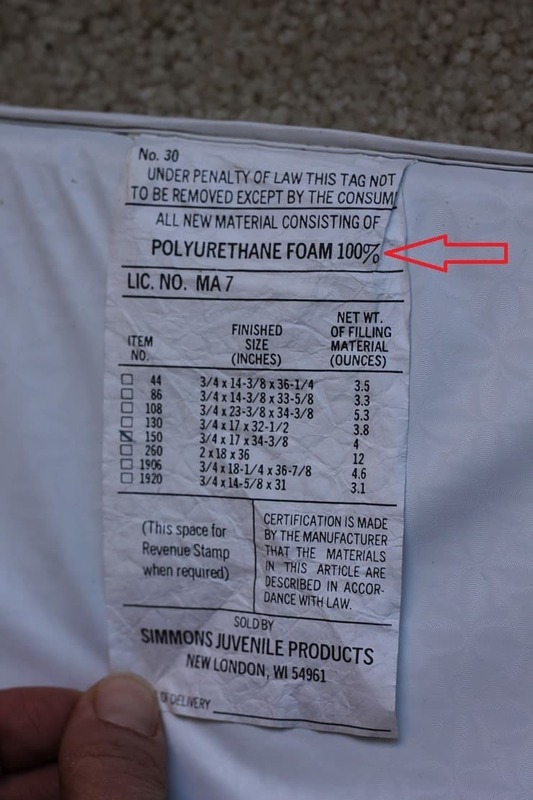 I’m curious if you have any safety info about those materials, and if polyurethane laminate (PUL, a fabric used for many cloth diaper covers) has the same risks as polyurethane foam. Thanks for the research! My first child was not a bedwetter, but it’s too early to tell with the second one. Interesting thinking ‘Becca! I didn’t come across anything made out of those, but perhaps they’d be a great DIY version. I’ve noticed that my babies don’t really leak through their polyester fleece zippered “bags” unless it’s a really serious leak. But I wouldn’t want to have that be the only waterproof layer on a mattress, too risky. The whole safe sleeping issue is one I’ve been working on for a while (on a small budget)! My two bigger kids are sleeping on the floor – it was even their idea – so I didn’t need to buy any new mattress for them. I tried sleeping on the floor (with just a couple blankets under me) and I think it would be fine if I wasn’t trying to keep the nursling happy all night. I’ve thought about buying a futon mattress, but we don’t have any local sources, and is it possible to find one without flame-retardants from far away? I’d really like to spend no more than $200 on a single bed… all the organic fancy mattresses are much more. That sums it up perfectly and I also feel annoyed at the general public because most people are not so informed as your readers. I think, shouldn’t your family’s health and well-being be a priority? It just seems irresponsible in today’s advanced-technology information age. Thank you for the many hours of research you put in to help others be informed. I’m worried a bit now, i use the mattress covers from http://www.protectabed.com/content/mattress_protectors.asp what do you know about them? i want to keep my mattress safe and me and my family at the same time. please help me! Looks like that one is made from polyurethane, which isn’t perfect but better than vinyl. Keeping the dust mites out is a good thing! Do you have any idea what is typically used in “rubberized flannel sheeting”? I’ve bought this by the yard to make my own mattress protectors and changing table pads, but unfortunately doesn’t have any info about what is in it. No, sorry Clare, I’ve never heard of it. That would be so nice if it was a better alternative! How well do mattress protectors seal? If I have a toxic memory foam topper on my bed and then seal it with a good mattress protector then won’t that seal in the toxins? Are mattress protectors breathable? Trying to find an alternative without spending thousands on a new mattress.